When a nutritional supplement has been studied in more than one dose for one or more indications, it’s imperative to decide what the best starting dose should be in a typical case. This seems simple; however, even reviewing the same data, clinicians can come to opposing conclusion and thus, dosing strategies. We often do not think about a style of recommending or prescribing, but essentially the art of medicine requires it. 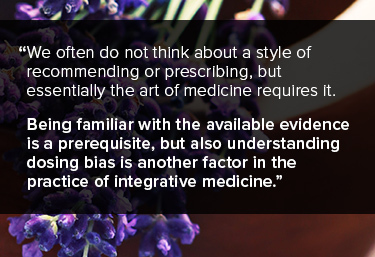 Being familiar with the available evidence is a prerequisite, but also understanding dosing bias is another factor in the practice of integrative medicine. We asked two clinicians about their style of recommending an oral lavender supplement. Lise Alschuler, ND, FABNO regularly uses oral lavender oil for her patients. She has practiced naturopathic medicine since 1994, is the author of two books, several booklets, articles, and chapters and is the Executive Director of TAP Integrative, a non-profit organization which provides unprecedented access to integrative healthcare experts and a unique opportunity to learn from the expertise of fellow clinicians in order to improve clinical outcomes. Question: Dr. Alschuler, for which types of patients do you typically recommend oral lavender oil? Dr. Alschuler: I am heavily influenced by the evidence associated with oral lavender oil and refer to the work of Kasper, Uehleke, Woelk, and others. In many of the studies, the Hamilton Anxiety Rating Scale (HAM-A) was used as a tool in this research which consists of fourteen categories of observable behaviors and reported experiences. When I have a patient that fits the subject selection criteria, it is common for me to recommend oral lavender oil. Question: Dr. Alschuler, how do you typically recommend oral lavender supplements? Dr. Alschuler: This is a great question given the available evidence and my clinical experience. The first studies that were published on the use of oral lavender oil were on 80 mg. This was shown to be an effective dose. In very simple terms, I like using the lowest effective dose of a number of agents. This one is no different. I start at 80 mg and if, after consultation, the patient and I decide that a higher dose is needed, I make that recommendation. I feel comfortable with the increased dose because of the published studies using the higher dose, but I do not find it necessary to begin there. In some circumstances, I may recommend that the patient make the decision on their own and just report to me if they have decided to increase the dose. This provides them a bit of flexibility in its use and I can keep track of what dose they routinely use. Question: Is there ever a time that you may not choose this style of dosing for oral lavender oil? Dr. Alschuler: There are some cases where the patient wants to be more aggressive right out of the gate or they have previously use oral lavender oil at the lower dose or perhaps topically without an adequate response. Corey Schuler, RN, MS, CNS, LN, DC also regularly uses oral lavender oil for his patients but has a different recommendation style. He focuses his practice on nutrition assessment and robust response-guided dosing. His experience in both conventional and integrative approaches has taught him to seek the fastest yet safe route to patient outcomes. Question: How is your dosing strategy different than Dr. Alschuler’s? Dr. Schuler: I like to see change as fast as possible. While I know that some of my patients will have an effect of oral lavender oil supplementation at the lower 80 mg dosage, I want to know if this particular patient is going to have a benefit from this product and I want to know it as soon as possible. The best way I know to test this is to start at the upper dosage studied or 160 mg. If we gain a satisfactory response, we can then either continue on that dose or do a trial of partial discontinuation. We drop down to the 80 mg dose to see if the response is still adequate. Question: Would you ever start at 80 mg instead? Dr. Schuler: I do. When a patient reports to me that they are “sensitive” and often use a low dose of most oral supplements or medications, I will start with the lower dose of oral lavender oil of 80 mg. The reality is that neither style is correct. Such a style is determined by the existing evidence, experiences with the particular intervention, recommendations by colleagues, and patient preferences. It is also informed by aspects of the therapeutic encounter that are often difficult to quantify. The art of integrative medicine is complex and often requires a conscious awareness of the clinician’s dosing habits, behaviors, and bias. Kasper S, Gastpar M, Müller WE, et al. Lavender oil preparation Silexan is effective in generalized anxiety disorder--a randomized, double-blind comparison to placebo and paroxetine. Int J Neuropsychopharmacol. 2014 Jun;17(6):859-69. Heger-Mahn D, Pabst G, Dienel A, Schläfke S, Klipping C. No interacting influence of lavender oil preparation silexan on oral contraception using an ethinyl estradiol/levonorgestrel combination. Drugs R D. 2014 Dec;14(4):265-72. Doroshyenko O, Rokitta D, Zadoyan G, et al. Drug cocktail interaction study on the effect of the orally administered lavender oil preparation silexan on cytochrome P450 enzymes in healthy volunteers. Drug Metab Dispos. 2013 May;41(5):987-93. Kasper S, Gastpar M, Müller WE, et al. Int Clin Psychopharmacol. 2010 Sep;25(5):277-87. Woelk H, Schälfke S. Phytomedicine. 2010;17:94–9. Kasper S, Anghelescu I, Dienel A. Eur Neuropsychopharmacol. 2015 Nov;25(11):1960-7. Uehleke B, Schaper S, Dienel A et al. Phytomedicine. 2012. Jun 15. 19(8-9):665-71.